Visit one of Arkansas' many caves. Eureka Springs, Berryville, and Harrison have multiple choices. Arkansas, "The Natural State", has several caves to visit in the Northern Regions. The northern sections of Arkansas are home to several cave attractions. War Eagle Caverns and Cosmic Caverns are both in the Eureka Springs area. Mystic Caverns is located south of Harrison. Old Spanish Treasure Cave is in the far northwest corner of the state west of Bentonville, which is the hometown of Wal-Mart. While in the Bentonville area make sure to leave time for the Crystal Bridges Museum of American Art, sponsored by Wal-Mart. Bull Shoals Cavern is located near Mountain Home. Blanchard Springs Caverns, located in Mountain View, is near the Ozark Folk Center. The Folk Center is a state park that is dedicated to the preservation of the Ozarks' way of life. The northern sections of Arkansas are rich with outdoor activities. The Buffalo National River, dedicated in 1972, has the distinction of being the first National Riverway in the United States. There are multiple state parks that provide camping, hiking, fishing and floating opportunities. Pea Ridge National Military Park and Prairie Grove Battlefield State Park both interpret Arkansas' role during the Civil War. 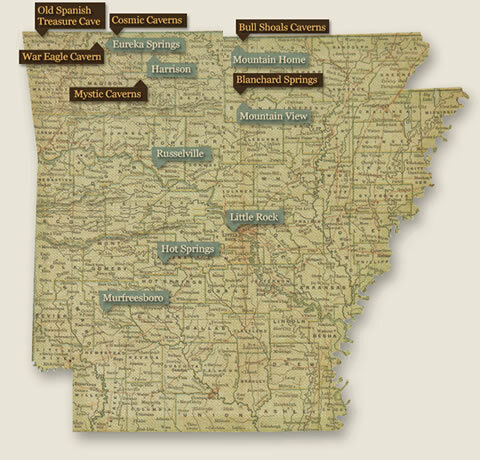 Those who are pressed for time, can still experience northern Arkansas on the Scenic 7 Byway. Winding through the Ozarks' Boston Mountains south in to the Ouachita Mountains. The southern sections of Arkansas are not home to any caves, but there are many outdoor and cultural activities. In Murfreesboro you can mine for diamonds at the Crater of Diamonds State Park. Not far from Little Rock is Hot Springs National Park. The nations first national park preserves and interprets the resort town and thermal springs surrounding it. Little Rock is the state's capital. It is also home to the Clinton Presidential Center and Park, located on the banks of the Arkansas River. The library contains the largest collection of presidential papers and artifacts in U.S. history and includes an authentic replica of the Oval Office and the Cabinet Room. While in Little Rock, make time to visit the Little Rock Central High School National Historic Site. The first African-American students, "the Little Rock Nine", were admitted to the school in 1957 following a dramatic confrontation between Govenor Orval Faubus, who used the state's National Guard to block desegregation, and President Eisenhower, who sent federal troops to enforce it. No matter where you are traveling, the natural state has something to offer everyone.